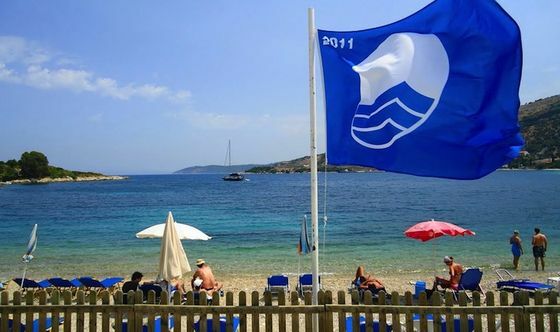 395 Greek beaches and nine marinas won the international quality Blue Flag award this year, putting Greece in third place worldwide among 50 countries, according to the Hellenic Society for the Protection of Nature (EEPF). The announcement was made during a EEPF press conference in Katerini. EEPF is the national operator of the International Blue Flags program in Greece, in cooperation with the Pieria Hoteliers Association. According to EEPF, the Blue Flag is the most recognizable and popular international symbol of quality in the world. Since 1987 the award has been given to beaches and marinas that meet the strict award criteria. The beaches not only need to have excellent quality bathing waters. They also need to meet 32 criteria, which refer to cleanliness, organization, information, swimmer and visitor safety, protection of the natural wealth of the beach and coastal area, as well as environmental awareness.